Julien Bompard indeed has a good heart. Reflective of his restaurant, service is always done with a smile. You can be sure that you will feel ‘at home' at Saint Julien. As proprietor and owner of Saint Julien Restaurant (where the Merlion used to be situated), a delectable gastronomic experience is offered to every customer that dines in, making sure that you step out of the restaurant with a smile – and a full stomach. Visit Julien's Website at www.saintjulien.com.sg. Culinary trends – where do you see it going? Traditional cuisine with honesty, a convivial eating with respect of products and curiosity on wine pairing. In your opinion, what three cuisines will dominate globally? What changes do you foresee in the next 10 years for your position as an chef / owner? Competitions with young chefs who will follow and set up their own restaurant but will bring great energy and development to the industry. Traditional food and restaurant will be recognized outside of the original country. Who makes better chefs: women or men? Nothing of that, there is no difference. A good chef is a good chef, a chef can be women, men or gay - I don’t see the difference when the food is in the plates. Owners get more and more involved operations, do you think they should stay in the kitchen or get out of it? If the owner is a professional of the industry (at least 10 years experience) then he should stay in the kitchen meanwhile if he is not a professional then a relation with guests will be more appropriate. Meanwhile a clear communication channel of after-service chat with the chef is necessary. Do you think brand (so-called Star Chef affiliation) are beneficial for hotels? Restaurants should be the heart of a hotel, so why would you get a different heart. Promoting you own chefs and team seem to be more important and after all it is your staff who do the cooking. In a world of globalization, do you think it has a positive effect or that of being over managed and over controlled? Over management always minimize the creativity and spontaneous decision-making especially on critical situations. Meanwhile, over control can help your staff know what the right decision to take in critical situation. Your greatest experience in the kitchen? Everyday at the peak of the operation “the rush of firing, cooking and plating. If you could change 5 things that we operate, what would it be? 2. Frustration of staff needs to be discussed openly. 4. Restaurant should install a system of occupancy (same as hotel room occupancy) to evaluate the business and direct monthly bonus by result should be distributed. 5. Managing by dollar sign (budget and forecast) should not be the driving force of management. Your worst nightmare in your career? If you start all over again what would be the three jobs on top of your list? Organic grown food products, a fad or real benefits ? Seems to be a bit extreme for me but I truly respect it and believe it give us some reality guidance in grown food products. Do you think bars should be non-smoking? Do you think chefs should be required to have an AIDS test? Kitchen is a profession where sometimes blood appears, so yes test should be required, and anyway every body should do it. Do you think people appreciate and know what they eat? Yes a good majority of people are concerned and interested, but in a society of nowadays does not always make have the time to know what we are eating. Are all health conscious diet trends really worth the effort? Mentally yes, otherwise being disciplined of eating properly is the best solution. Both my wife and I. Are you fussy about your food at home? No, home food is casual and simple, everything is good. Do you want your kids to get in or stay away from the cooking business? 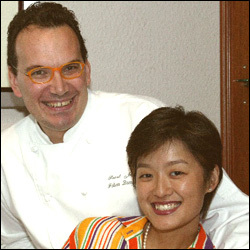 Julien Bompard is the Proprietor and owner of Saint Julien Restaurant in Singapore. He and his wife Edith Lai, relied on the tried and tested “double t” formula – team and talent, to make Saint Julien like no other restaurant.